A friend of mine bought her first car yesterday. It got me thinking about my first car. My first car. There are no real words to appropriately describe that beast. When that thing rolled out of somebody’s shed it was the most beautiful thing I have ever laid eyes on. It was my freedom. My ticket to get to go anywhere I wanted to at anytime. I didn’t have to wait on anybody to take me anywhere ever again. So, with that said, the car pulled out of the guy’s shed that we bought it from. There it was — a standard Chevrolet Cavalier station wagon. It cost all of $800. And frankly, it wasn’t even worth that at the time. But it was still mine. So I didn’t care. In the months to follow I realized what I had gotten into. The car dropped a quart of each of power steering fluid and oil a day. I bought that stuff by the case and had to park with cardboard under my car so as not to leave huge oil spots. The car had a manual transmission. I knew how to drive one, but this beast was so much different. I spent months terrified of stoplights on hills. I knew every route in my hometown that was as flat as possible. Today, almost all my cars have had manual transmissions. I’ve come to love the extra sense of power you get from it. Can’t say I was too thrilled about it with that station wagon though. I put that station wagon through hell. I drove it to the lake nearly every weekend. It barely made it up hills. But it always did — as long as I started with a run. I ran that car everywhere. It was still running the day I traded it off for something more reliable. And I cried. My first car was gone. To this day I have never felt the same way as I did about that car. The car with no horn. No air condition. No cuteness whatsoever. But it was mine. My freedom. Any first car stories anybody? Kat since it’s your car I am writing about. I’d LOVE to hear yours!!! I can’t believe the week has come and gone already. I enjoyed my time in Colorado…BUT I must say that it just isn’t home. My heart, my roots and my life is in Kansas where I grew up, where I’ve learned and loved and even hurt. While it was nice to vacation in Colorado, I am so glad to be on home soil — my territory, my home. Life here is familiar to me. It’s beautiful, wonderful and glorious here in Kansas. If you’ve never been, it’s a pretty state (just visit the flint hills). As I entered back into Kansas there was the familiar rolling wheat fields and large clouds of dust in the distance generated by the combines cutting the golden, ripe wheat. There was the staggering heat and the wind that comes with it. I even find that endearing. There was the large wind farms near Ellsworth. The grace and beauty of the wind turbines are hard to explain. There were hills dotted with cattle happily grazing in the lazy summer day. Kansas in the summertime. It’s a beautiful place and I’ve come to love it very much. I’m home. This is where I belong. This is where my heart and soul is. 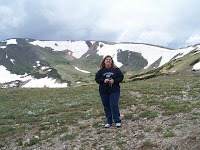 I can hardly believe this is my last night blogging from my cabin in Colorado. Tomorrow it’s back to Kansas…back to life. 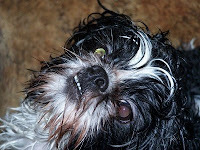 The good news is I get to see my doggies! I miss them so much! 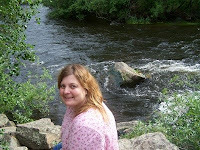 So today I decided to do a little “what I learned” while in Colorado blog. Enjoy. I’ve learned that even in the most desolate places, life can thrive. These are some beautiful tundra flowers. These plants grow a fraction of an inch a year. They thrive in sub-zero temperatures and a growth season of less than two months a year. I’ve learned that even the most beautiful places are not immune to Mother Nature’s fury. 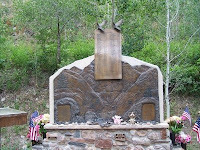 The memorial to the right was dedicated to the 144 lives lost in the Big Thompson Canyon flood of 1976. Children on up to seniors lost their lives — many of them families vacationing in the canyon. More than 4 inches of rain was dumped in less than 12 hours, causing a massive and deadly flash flood. I’ve learned that it’s ok to stick your head out the window and smell the crisp mountain air. 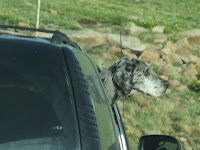 This dog was hanging out of a window in the tundra area in Rocky M ountain National Park. Rock on doggie!! I’ve learned that no matter what kind of day you’re having there’s always a friendly smile waiting for you somewhere! This is my new friend Sampson who I adopted from Rocky Mountain National Park. 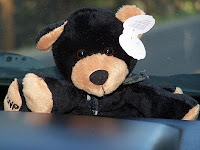 Isn’t he cute?? I’ve learned that no matter how old you are it’s still ok to play in the snow! Just like this Elk! Here are some pics I forgot to upload. 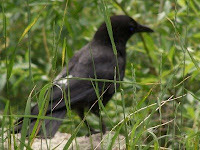 These are all taken by me of wildlife in the park. So, here in Colorado it isn’t all about mountains! I’ve found a few off-beat things to include in here. 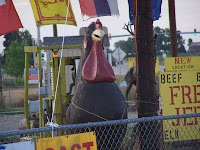 There’s a giant chicken in Longmont. 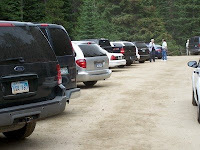 A “little tourist room” in Rocky Mountain National Park. 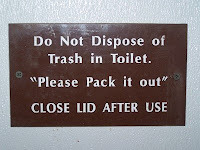 Do NOT put your trash down the toilet to your right! It’s bad manners and bad for the environment! 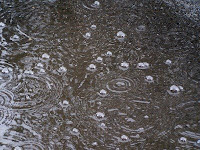 The raindrops is one of my personal favorite pictures. It’s rained every single day here. Truly you can “set your watch” by the rain showers (and sometimes storms) in the afternoon. Anybody have any acting skills? 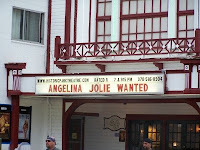 They’re looking for an Angelina Jolie here in Estes Park! It is not uncommon at all to see people bring their dogs to work. 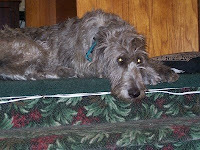 This Irish Wolfhound was exhausted after a day of playing shopkeeper with his master. Take the Raven to your right. He too, looks normal at first glance. But his right foot is deformed and he can only hop on it. But he gets around fine and is a friendly addition to the cabin. The chipmunk, which is featured in yesterday’s blog today decided he needs to sit in my lap and beg for peanuts. I kid you not! It’s awesome to have this little creature sit in your lap and look at you…luckily we have plenty of food for our “special” critters. The rest of today was fun as well. We went up the mountain. It was SOO Much fun!! Visited the falls to your left and climbed some rocks. Had an awesome time!! Some of the wildlife we encountered today was moose, elk and a marmot. Pics to follow! 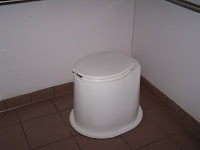 Check tomorrow for my off-beat blog! Have a great one!! Another eventful day in gorgeous high-country Colorado. A very eventful day starring lots of wildlife. 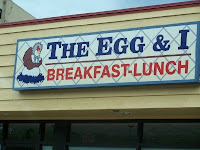 Started out the day at the restaurant to your left — The Egg and I where they make the best breakfast anywhere! There’s always a wait, but it’s worth it. The breakfast is simply fab! Second adventure of the day was the wildlife. Here, as you can see, the wildlife isn’t afraid to eat out of your hands. The paws of the chipmunks are so soft when they take food (unsalted peanuts) out of your hand. They come up with their cheeks stuffed full of food begging for more. It’s simply so cute! The animals are adorable! This evening we went to see my former colleague and dear friend Scott. It was so nice catching up, swapping newspaper stories and woes and just in general taking in the local scene with good company. 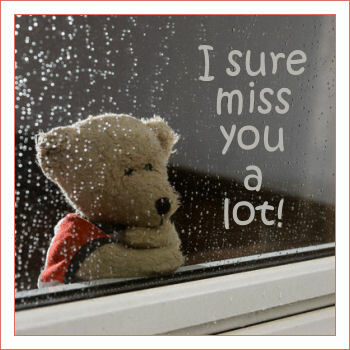 I do miss my dear friend! So here we are laughing and joking like old times! Sure do miss you friend!! Stay tuned. Tomorrow’s installment will include another trip up the mountain on MY BIRTHDAY! 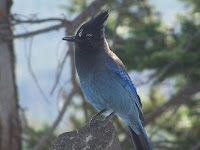 I get to spend my 2008 birthday in the high country! YAY!! Wednesday’s blog will include a collection of some of the more off-beat things I’ve found in Colorado…like a giant chicken…dogs hanging out in shops. Stay tuned!! It’s very hard to summarize a day like today. The title about says it all! DAMN TOURISTS. Beautiful mountains and DAMN TOURISTS. Cool (and almost oxygen free) mountain air and DAMN TOURISTS. Rain storm up a dirt one-way narrow mountain road and DAMN TOURISTS. Grocery store to buy supplies and DAMN TOURISTS. Shopping in downtown Estes and DAMN TOURISTS. So, you’re probably wanting me to explain now. My day started out at the local Safeway. I (like a moron) forgot to clear my camera card (and I only have one) so I found a photo machine to make a picture CD with. This old man and his grandson stand behind me thinking it was the lane where you pick up prints. That lane was to my left. He proceeds to ask me in a not-so-pleasant tone “are you going to make god-damned copies all day?” I glared at him and turned around and went on with my business. I refused to give him the time of day. DAMN TOURIST. After we proceed to leave the store we get cut off by more DAMN TOURISTS in the parking lot. What the heck?! The pict ure to the right represents the scene of our next run on with DAMN TOURISTS. I was toodling along behind some cars to go see the waterfall (pic to the left) when I looked over and put my hand out, which was met by a car windshild. The guy backed right into me!!!! DAMN TOURIST. Let me say that no, I was not hurt. He stopped when he heard my hand smack his back windshield. Left you see what we came to see. Truly beautiful. Despite the DAMN TOURISTS. 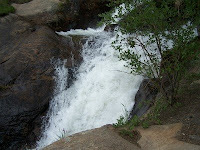 So, to get to the view you see to the right (stunning) we had to go up what is called Old Fall River Pass. Now, let me explain. This is a very primative road used before they paved the other road. We have a SUV so we thought we’d be “big and brave” and go up this road. It’s nine miles one-way and DIRT. We’ve been up it before, but never in the RAIN. Yes, in the rain. Try climbing a dirt road in the rain one way. Closer to the top above the tree lines was a ton of snow. We have never seen so much snow in July. I even managed to throw a snowball. It was unlike Kansas snow. It was mini ice balls. Really pretty. Even in the tundra area there is life. 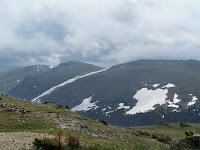 The temperature went from a balmy 73 degrees to 41 degrees at the top of the mountain in Rocky Mountain National Park. It was cold but a dry cold. 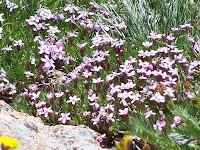 These flowers are representative of the abundant life up there. I thought they deserved to be a bit bigger than the rest of my pictures. 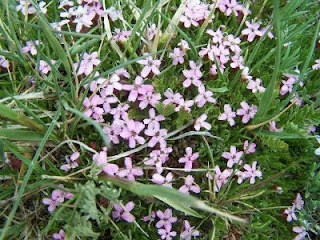 Plants in the tundra only grow a fraction of an inch a year — to what you are seeing is many decades of growth. Finally get to the top of the mountain and to the mountain store. You guessed it. More DAMN TOURISTS. Lots of them played in the snow, gawked at three Elk and just flocked in every nook and cranny. Overall, it was a great day. Oh, and by the way…I just realized I’m a DAMN TOURIST too. 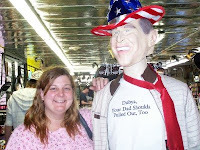 But I’m trying not to mimic the other DAMN TOURISTS’ behavior! Took this tonight. For all you Bush fans I’m sorry. Hey wait, no I’m not! LOL. 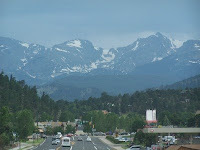 So here I am…in Estes Park, Colo. If you asked me right this second if I wanted to leave here and come back to my “real” life I’d tell you HELL NO. Absolutely not! As I sit here outside my cabin (because the broadband will only work out here) I’m listening to the roar of a mountain river right below me. It’s beautiful. So, here’s a quick run down of the day. And it’s gonna be QUICK because I want to get into my hot tub!! Here was my first thrill of the day — the wind farm near Ellsworth, KS. How majestic they were turning in the wind. Just lovely! And here you have our view. Isn’t it pretty? So, par for the course here, we forgot that this is Rooftop Rodeo week starting on Tuesday. So the massive tourist town just got bigger. Ugh. More to come. There’s a parade on Tuesday!!! And now…HOT TUB TIME! CYA ALL!!! Well, ok, sort of. In a perfect world I would be much farther than Park City by now. But, once again, like this entire week, it’s bee less than a perfect ride. So, as I pass Park City and the now deserved Greyhound Park and the failed Wild West World I have visions of mountains in my head but am still stuck with the plains in my view. Go figure. And this typing on the fly while my friend drives thing is actually pretty cool! Sorry, no pics yet. It was more pain and trauma than it was worth trying to get a picture of the dogs when they were being dropped off at the boarding kennels. So far this morning we’ve dealt with incompetent vet records. We get to the kennels and everything was going fine until the dude said “Chewie and PJ aren’t current with their vaccines.” What the heck?! We watched them get all their vaccines. So, after two phone calls to the vet back home that was finally straightened out. This followed by a trip to the gas station where some lady decided to camp out in the bathroom. So, yeah…you get the drift. Didn’t get to go to the bathroom. Ah…life is starting out fine. So, before I run out of decent signal, I’m going to close this entry by saying ARE WE THERE YET?!!! !